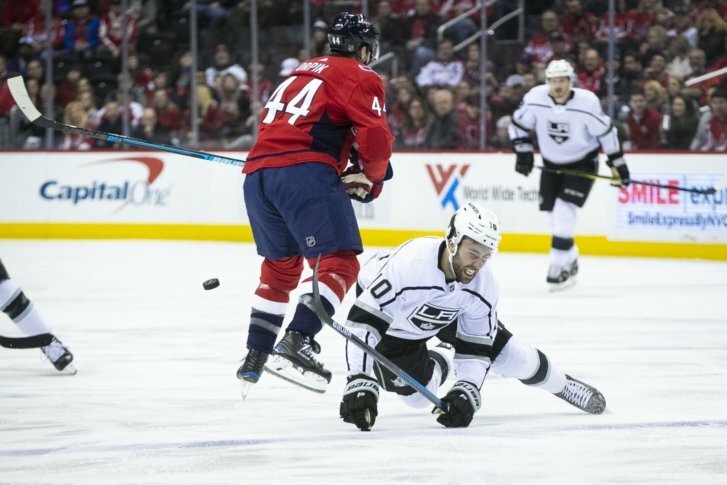 In their final game of a lengthy homestand, the Capitals’ offense surged to deliver a 6-4 win over the Los Angeles Kings. Depth scoring doesn’t always cut it, as the Caps have learned in recent weeks. Monday night’s game featured goals from every line, an odd but not unwelcome change. The first period proved to be a volley, with Alex Ovechkin scoring the first goal of the game on a power play. Los Angeles’ Austin Wagner answered a minute and a half later. Later in the first period, Brett Connolly scored to take a brief lead 2-1 lead. Due to another penalty against the Caps, Tyler Toffoli scored on the power play, another quick answer to tie the game once more. The second period was similarly hectic, with Oscar Fantenberg scoring three minutes into the third. But unlike their pattern of one-goal games, the Caps pulled it together, determined, and scored three unanswered goals throughout the second period. The first came from Evgeny Kuznetsov, his first of the game. The second belonged to Christian Djoos, his first of the season after returning from IR on Saturday night. The third was a fantastic shot from the knee by Jakub Vrana. Though Austin Wagner brought the Kings within one goal with his third-period tally, the Caps were having none of it. Kuznetsov netted another with five minutes left in the game. His impressive bar-down corner shot was met with raucous applause, and sealed Washington’s victory. Over the six game homestand, the Caps took four wins, but had points in five. They’ll head out on the road to face the Blue Jackets in Columbus tomorrow, then out to the west coast to visit Anaheim, Los Angeles, and San Jose; after that, they’ll head north to play Toronto and Buffalo. One thing to take away: Despite recent concerns about his play, Kuznestov had four points in Monday’s win to bring his total to 10 in the last four games. Keep your eyes on Kuzy and his well-deserved confidence as the Caps hit the road.